The main physical features of the Leschenault catchment are the coastal dunes from Bunbury to Binningup, the Leschenault Estuary and Inlet, the wetlands and woodlands of the Pinjarra Plain, and the foothills and forests of the Darling Range. The Leschenault Estuary drains the catchments of the Wellesley, Brunswick, Ferguson, Collie and Preston rivers. The Leschenault catchment encompasses portions of the Yilgarn Craton, the Collie Basin and the Perth Basin. The Darling Plateau is the surface expression of the Yilgarn Craton, with its western boundary being formed by the Darling Fault which extends north-south through the Leschenault catchment area passing close to Harvey and Donnybrook. The Collie Basin is a sediment filled trough formed by subsidence of the Yilgarn Craton between fault lines near its western margin (Wilson 19990). The Perth Basin occurs to the west of the Darling Fault and extends to the edge of the continental shelf. The surface expression of the Perth Basin is the Swan Coastal Plain north of the Whicher Scarp, and the Donnybrook Sunklands (also known as the Blackwood Plateau) to the south. The geomorphic regions of the Leschenault catchment, being the Swan Coastal Plain, the Darling Plateau and the Donnybrook Sunklands (or the Blackwood Plateau), can be further divided more detailed soil landscape zones. The Swan Coastal Plain is a level to gently undulating plain formed on mostly quarternary sedimentary deposits overlying the Perth Basin. Within the Leschenault catchment it is about 15 km wide and its principal components are a series of dune systems running parallel to the coast, and an inland alluvial plain. Over most of its length the inland boundary of the Swan Coastal Plain is formed by the Darling Scarp although to the south east of Bunbury the boundary is formed by the Whicher Scarp. This portion of the Swan Coastal Plain contains three soil landscape zones, the Coastal Dune, Bassendean and the Pinjarra zone. Soil landscape systems mapped within these zones are, progressing from inland to the coast, the Quindalup dunes, the Vasse estuarine system, the Bassendean dune system, the Spearwood dune system, the Pinjarra Plain and the Forrestfield foothills. The Donnybrook Sunkland (Blackwood Plateau) overlies the Perth Basin south of the Whicher Scarp and to the west of the Darling Range. It is a gently undulating lateritic plateau dissected by shallow valleys and comprises a single soil landscape zone of the same name. Within the Leschenault catchments area it occurs generally between Boyanup and Donnybrook and the component soil-landscape systems are the Blackwood Plateau, Goodwood Valleys and the Whicher Scarp. The Darling Plateau, occurring inland from the Darling Scarp, is the surface expression of the Yilgarn Craton. Its western-most portion, extending from Bridgetown in the south to Jarrahdale in the north, is referred to as the Western Darling Range zone. The Western Darling Range zone encompasses most of the Leschenault catchment and is dominated by the gently undulating lateritic plateau with deeply incised valleys where the surface has been dissected by major river systems including the Collie. Within the Leschenault catchment the Western Darling Range zone contains three soil-landscape systems, Coalfields, Darling Plateau and Lowden Valleys. The Leschenault catchment encompasses the Collie River Basin and the Preston River Basin and their sub-catchments. The Preston Basin includes flows from the Ferguson River, and the Collie Basin includes flows from the Bingham, Harris, Wellesley and Brunswick Rivers. The Preston and Collie Rivers then discharge directly into the southern end of the Leschenault Estuary. Drainage from the low lying coastal hinterland to the west of the Wellesley sub-catchment discharges into the northern end of the estuary via the Parkfield Drain. Discharge from the estuary into the ocean then occurs via the ‘Cut’ through the Leschenault Peninsula. The Leschenault Estuary and those waterways mentioned above, leading into it are identified as SWCC Regional Priorities. Learn more. The Preston River is regionally significant as a water resource and as such is also identified as a SWCC Regional Priority. Learn more. Significant modifications have been made to the natural landscape to accommodate agriculture within the Swan Coastal Plain. Many sections of previously naturally-occurring streams and rivers have been modified, and extensive construction of additional ‘artificial’ drains has occurred. The total length of drains within the coastal plain portion of the Leschenault catchment is 3318 km (LCCG 1995). The primary engineering objective of drains is water conveyance to reduce waterlogging and inundation of otherwise productive agricultural land. However they also provide a major conduit for nutrients and sediment to flow into the estuary, by-passing the filtering processes associated with more natural waterways and their fringing natural vegetation. Most wetlands of the Leschenault catchment are surface expressions of the groundwater and a large proportion of those along the coastal plain have been drained or degraded through urban and rural development (WA Water Resources Council, 1991). There are two main groundwater flow systems in the area – the unconfined aquifer in the superficial (near-surface) formations, and the confined system in the underlying formations (confined water is water held within rock layers). Substantial quantities of confined and unconfined groundwater of varying quality occur in the Perth and Collie sedimentary basins. In the hard-rock Darling Plateau, groundwater also occurs, but in lesser quantities in fractured rocks and surficial river alluvium. Four groundwater management areas (GMAs) are proclaimed within the Leschenault catchment. The groundwater resources of Bunbury, South West Coastal and Busselton-Capel GMAs are important as public drinking water sources and for self supply for agriculture, industry, horticulture, dairying and viticulture. The fourth GMA, being the Collie GMA, is over allocated as a result of dewatering practices from mining and power generation processes. The Leschenault catchment encompasses numerous large and small areas managed for conservation, either by the Department of Parks and Wildlife (DPaW formerly DEC) or by local government authorities. Approximately 34% of the catchment is designated State Forest (SWCC, 2015) – Boyanup, Collie, Harris River, Muja, Mumballup, Myalup, Wellington and Wilga State Forest. and numerous un-named reserves vested in Local Government and managed for conservation purposes. As much of the native vegetation over the coastal plain has been cleared in the past to enable the development of agriculture, industry, mining or residential settlements, vegetation remaining within large and small reserves provide important landscape functions. Vegetation (remnant and revegetation), natural waterways and wetlands located outside of these areas also provide important functions, acting as stepping stones and linkages between these small and large conservation reserves. Regional ecological linkages have been identified across the catchment and can be learned about here. Local linkages can compliment these regional linkages but are identified at a more local scale. The Leschenault catchment encompasses two bio-regions, the Swan Coastal Plain and the Jarrah Forest which is split into the northern and southern sub-regions. Learn more about the vegetation of the Swan Coastal Plain and Jarrah Forest bio-regions in the Leschenault catchment. The Swan Coastal Plain bio-region corresponds to the southern portion of the geomorphic region of the same name. It contains a wide variety of vegetation, and rainfall ranges between 600 and 1000 mm annually. In coastal areas low scrub and heathland dominated by Olearia axillaris and Scaevola crassifolia back the primary coastal dunes. Myrtles (Hypocalymma robustum) and buttercups (Hibbertia hypercoides) occur on the coastal flats, and tuart and peppermint (Agonis flexuosa) woodlands with a dense understory of zamia palm (Macrozamia riedlei) occur in the more inland sands derived from limestone. Areas of the coastal plain subject to waterlogging and inundation, such as Benger Swamp, support low woodlands or forest of Melaleuca rhaphiophylla and thickets of Melaleuca preissiana or sedgeland (Beard, 1980). The Jarrah Forest bio-region occurs on the Darling Plateau and within the Leschenault catchment corresponds to the Western Darling Range soil-landscape zone where rainfall declines from about 1200 mm on the scarp to approximately 600 mm in the east and north. Portions of two sub-regions are encompassed, the Northern Jarrah Forest and the Southern Jarrah Forest. To the north of Collie the vegetation comprises jarrah-marri forest in the west with bullich (Eucalyptus megacarpa) and blackbutt (Eucalyptus pilularis) in the valleys, grading to wandoo (Eucalyptus wandoo) and marri (Eucalyptus calophylla) woodlands in the east with powderbark wandoo (Eucalyptus accedens) occurring on breakaways. Across the northern jarrah forest there are extensive but localised sand sheets with banksia low woodlands. Heath is found around granite rocks and as a common understorey of forests and woodlands in the north and east. Most of the diversity in the vegetation communities occurs on the lower slopes or near granite soils where there are rapid changes in site conditions. The Southern Jarrah Forest occurs to the south of Collie, where the Darling Plateau broadens and is less well drained. The forest and woodlands are generally similar to those in the northern area, but the understorey reflects the wetter conditions. Approximately 71% or about 3403 km2 of the Leschenault catchment is covered in native vegetation. However, most of this occurs within the Collie catchment upstream from the Wellington Dam on State land. 20% or about 976 sq km of the catchment is covered in remnant vegetation that is not on State land (Stuart-Street, 2003). Several plant communities in the catchment are now considered ‘poorly represented’, i.e. there is less than 30% remaining of the original pre-European extent. The Pinjarra system is particularly important as less than 10% remains. A further three of the soil landscape systems within the catchment have less than 30% of their original extent of native vegetation remaining; the Vasse, Bassendean and Forrestfield systems. To find out the definition of the conservation codes click here. Native freshwater crayfish (marron, gilgie and koonac) and native freshwater fish (freshwater cobbler, nightfish, western pygmy perch, black-stripe minnow (P3), western mud minnow (VU) ) are all under threat from loss of habitat, increases in salinity and eutrophication, as well as competition and predation from introduced fish species. The Leschenault Estuary provides habitat for thousands of resident and migratory waterbirds comprising more than 60 different species (DoE, 2004a). Learn more. Along with SCP Community type 10a – Shrublands on dry clay flats, Community types 7,8 and 9 above make up the Commonwealth listed “Claypans on the Swan Coastal Plain” which is Critically Endangered. Shrublands on calcareous silts (SCP Community type 18) (State listed as Vulnerable). 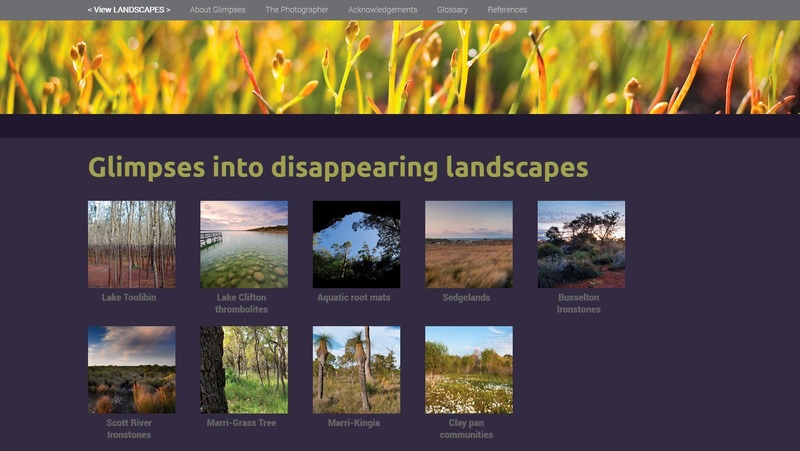 More information on the Commonwealth listed communities can be found on the Glimpses into disappearing landscapes website here. Copies of the book “Glimpses into disappearing landscapes. Nationally Listed Threatened Ecological Communities of the South West Region” are also available through SWCC. Other important ecological communities have been identified by Pen (1992) around the fringes of Leschenault Estuary. Learn more. The Leschenault coast is an important natural resource with tourism and local lifestyle values. It consists of sandy beaches extending southwards from Binninup Beach in the Shire of Harvey, to near Dalyellup Beach in the Shire of Capel. At Bunbury the sandy coast is interrupted by column-like basalt outcrops resulting in the formation of a shallow, now artificially modified bay, Koombana Bay, into which the Leschenault Estuary discharges. The coast is constantly changing due to natural processes in portions having either receding or accreting beaches, and shifting sand dunes. The fragility of many coastal features, increasing pressure from development and heavy recreational use creates challenges for management. The near-shore marine environment associated with the Leschenault catchment has significant biodiversity values, as well as social and economic values associated with recreational activity and commercial fishing. The Leschenault marine environment forms part of the Leeuwin-Naturaliste Marine Bio-region. It is characterised by a high energy, swell affected coast with a narrow continental shelf, where coastal waters are strongly influenced by the warm offshore Leeuwin Current and cooler inshore counter currents. Koombana Bay, Vittoria Bay and the Leschenault Estuary and Inlet are permanently open to the sea and form a sheltered extension of the marine environment along this portion of the west coast. An exception to the generally marine conditions occurs when fresh water runoff displaces the oceanic water in the estuary for a short period in winter and spring (DoF 2005). The estuary and sheltered bays ware important fish nursery habitats. Large areas of seagrass are present in the marine waters of this portion of the west coast. Aboriginal (Nyoongar) people have occupied south-west Western Australia for at least 38,000 years (Pearce and Barbetti, 1981). The area of land within the Leschenault catchment was traditionally occupied by four groups, the Wardandi group (south of Bunbury), the Pinjarup group (to the north and generally on coastal plain), the Wilman group (inland to the north east) and the Kaneang group (inland to the south east) (Bennell, 2004). The Nyoongar people are understood to have led a nomadic life prior to European settlement, moving as seasons changed from the hills to the coastal plain, taking advantage of different food sources. However expansion of settlement, combined with the devastating effects of introduced diseases eventually resulted in the displacement of Nyoongar people from many areas and the subsequent loss of many aspects of traditional lifestyle. Water and the landscape features it creates are particularly important in the customs and spiritual beliefs of the Nyoongar people. Many areas of significance to indigenous culture in the south west are associated with waterways and wetlands. Learn more. “The snake came down through the Collie creating the hills and rivers down to Turkey Point (Australind – Pelican Point area) and Eelaap (Bunbury). He pushed his big body and turned to form the estuary and Koombana Bay, He then came back up the Collie River to a place called Minninup pool. When the moon is high in the sky you can see his spirit resting there. Koombana Bay (before the Breakwater Rocks had begun) was a beautiful sea bay front from the ocean and Turkey Point was an Aboriginal ceremony camping, hunting and corroboree ground. Story told by John Sara with special thanks to George E Webb, elder Wardandi Tribe Busselton and Joseph Northover, Collie Nyungar. Leschenault NRM Sub-Region Catchment Management Strategy 2007. Land Assessment Pty Ltd for the Leschenault Catchment Council.